My whole extended family lives in Florida, near Tampa. Visiting them always feels like an amazing vacation full of fishing, boating, sunning, eating, drinking… We’ve got a list of things that we always do when we’re there. We never go to Florida without a stop at Frenchy’s for the best beach seafood anywhere (Souper Grouper Sandwich, fried with a side of extra special sauce). We also never go to Florida without visiting the small Greek town just south of where my Aunt lives. Tarpon Springs is known for their sponging industry. No seriously, you can buy a real, once-alive sponge there for your bathing pleasure. OK, now that I think of it that way, it’s a tad creepy. Anyway, they have a great little tourist shopping area full of spice shops, sponge shops, and restaurants. Tarpon Springs has the highest percentage of Greek-Americans in the whole country! The food there is to die for. When you order a salad in Tarpon Springs it comes served on a bed of Greek potato salad. It sounds weird, but it’s amazing. I’ve done some reading and it turns out this particular version of Greek salad is common to Florida. Well, I think we should institute it everywhere! None of the ‘Greek’ food around here tastes even remotely like Tarpon Springs food, so I try to make my own at home on occasion. 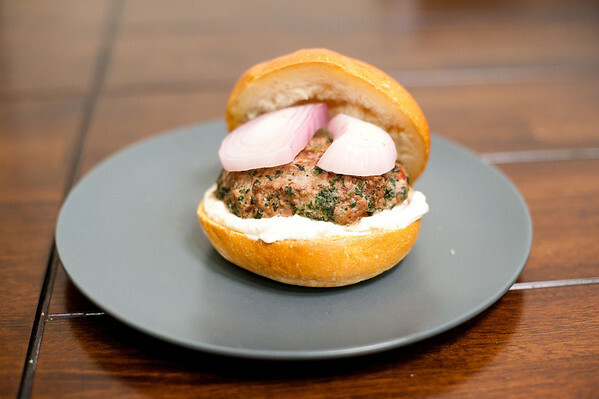 My brother’s favorite dish of mine is this Greek Burger, but it has a million ingredients and steps upon steps, so he only gets that for his birthday. 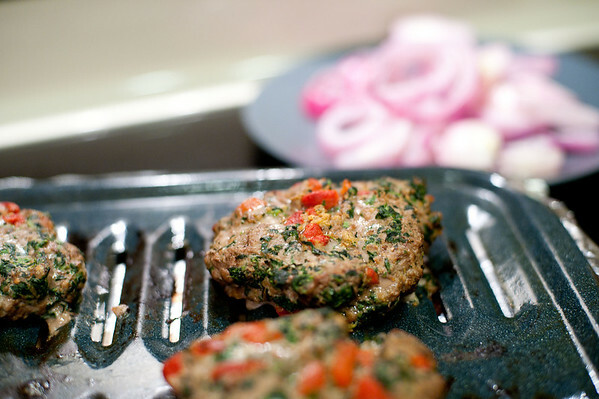 I wanted an easier Greek burger and I tried this one the other night. It’s the first time I’ve actually cooked with the broiler (usually I just use it to brown things at the end of cooking). Turns out the broiler is RAD for cooking. 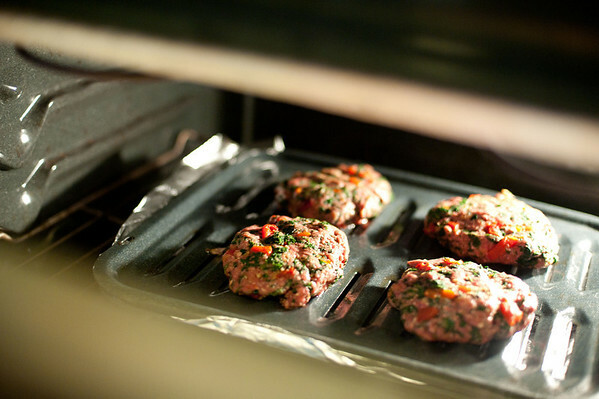 These burgers turned out super moist (I HATE that word, so the fact that I’m using it should impress upon you just how amazing they turned out). My rating: 4 out of 5 ouzos. Mmmm… ouzo. 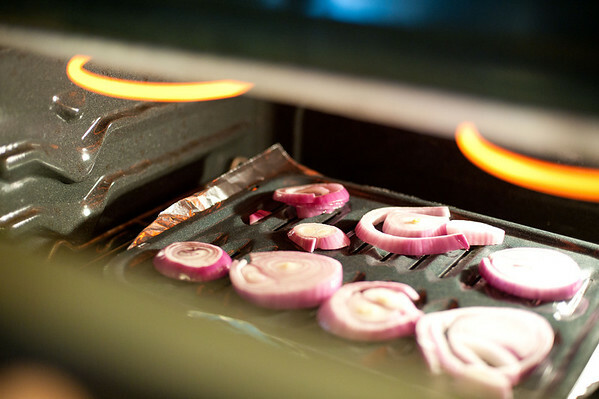 This recipe was a winner, but I’m going to broil the red onions a tad longer next time. Extra points for being a Cooking Light recipe. This so great!I could make a lot of this at home and add it in my snack box.